Cambridge means Harvard to most visitors who come to Boston, but Harvard is not the only thing in the city of Cambridge. MIT's there too, after all. 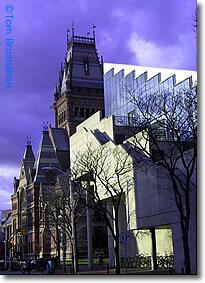 But Harvard Square, Harvard University and its museums are certainly the destination for most casual visitors to the city. Harvard Square, at the intersection of Massachusetts Avenue ("Mass Ave") and John F Kennedy Street in Cambridge MA (map), is a crossroads that teems with evidence of a hundred lifestyles, from the stuffily academic to the loosest of dropouts. All around you is Harvard University, with its many excellent museums, including the Harvard University Art Museums, Arthur M Sackler Museum, Museum of Natural History, and Peabody Museum of Archeology & Ethnography. Harvard Square has lots of stores, boutiques, cafes, restaurants and several places for evening entertainment, including cinemas, concert venues, and nightclubs. Just north of Harvard Square along Mass Ave is Cambridge Common, the historic common pasture, now a pretty park, good for a stroll, a rest, or a picnic.